The pani puri vendors of India give new meaning to ''hands-free''. According to Sumit Malhotra, of Aangan, the expert way to eat these streetside snacks is to sidle up to the vendor, who will pop each bite-sized puff straight into your mouth. The friendly staff at Aangan don't take service quite that far, but you should still try their version of this Indian street treat. Tiny balls of dough are rolled and tossed in hot oil, making them puff up like tiny flying saucers. They're cracked like a soft-boiled egg and spiced mashed potatoes are spooned inside. Malhotra serves them with ''spicy water'', a sauce made from fresh tamarind puree, roasted cumin powder and a touch of sulphurous black salt. 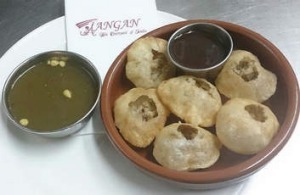 Aangan, 559 Barkly Street, West Footscray, 9689 4175; aangan.com.au. In the open kitchen at Tavlin, sparks crackle and gently float up from the charcoal grill like fireflies. Dough is stretched on a pillow, quickly pressed on the wall of a tandoor-like oven and mere seconds later emerges as thin, yet fluffy, laffa bread. 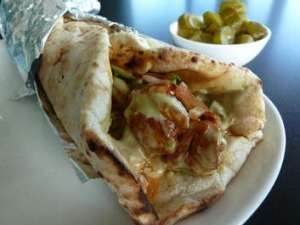 Wraps made with this Iraqi-style bread are a staple for Israelis on the go, and Tavlin's are worth crossing town for. Adi Daboush marinates chicken according to his Syrian grandmother's recipe, before grilling it on skewers until smoky yet juicy. It's then tucked in a pillowy round of bread along with hummus, tahini and an Israeli salad of cucumbers and tomatoes. You could eat it on your feet, but it's advisable to sit, lest you injure yourself from swooning. Tavlin, 678 Glen Huntly Road, Caulfield South, 9972 5666; tavlin.com.au. Spring rolls and rice-paper rolls are Melbourne's favourite preludes to a Vietnamese meal, but there's another star waiting in the wings. According to Long Nguyen of Sapa Hills, bo la lot are a Vietnamese night-market staple, grilled over charcoal by streetside vendors. At Sapa Hills, the digs are a bit plusher than a market stall, but the flavour's all there. Minced beef is mixed with seasonings, including lemongrass and five spice powder, before being wrapped in betel leaves and skewered. The leaves encircle the beef like delicate pastry and are cooked to a light, spinach-like texture. Wrap in plenty of lettuce and mint for a fresh start to a Vietnamese feast. Sapa Hills, 623 Glenferrie Road, Hawthorn, 9818 4776 and 112 Hopkins Street, Footscray, 9687 5729. sapahills.com.au. Tavlin's wraps are worth crossing town for. Mauritian Food, a modest eatery in suburban Dandenong, has been an outpost of Mauritian fare for the past 11 years. Expats stop in regularly for take-home packs of paratha bread or homemade chilli pastes, but take a seat at the lone long table inside for street-style snacks such as samosa or dholl puri. This Mauritian favourite starts with tender flatbread made with boiled chickpeas and plain flour and cooked on a hotplate. It's filled with pleasantly crumbly, nutty chana dal, tomato and coriander chutney and vegetable achard, a refreshing, zingy pickle made with vegetables such as carrot, french beans and cabbage. This is street food that packs a vitamin and flavour punch. Mauritian Food, 66 Hemmings Street, Dandenong, 9792 3882. Sand in your beachside sandwich getting you down? Bet you wish you were in Greece, where Alki Gerassimou says that beachside tavernas purvey trays of kalamaki to hungry sunbathers. These skewered, chargrilled meats are a favourite of Greeks, whether eaten by the sea or wrapped in greaseproof paper as lunch on the run. Closer to home, try a pork or chicken skewer, marinated in oregano, olive oil and a touch of fresh tomato. They're delightful on their own, or have them in a souvlaki, tucked up in Greek-style pita. Also a winner is the loukanik sausage - a tasty behemoth filled with finely minced, springy pork and a touch of sweet leeks. A range of Greek beers and soft drinks complete the picture. Kalamaki, 389 Lonsdale Street, Melbourne, 9602 4444; kalamakigsf.com.au.